Across the globe, fire/flow art and drum community meet ups happen in parks, beaches, city squares and music festivals, where passionate artists share space, energy and love, to create a community gathering that fuses together the beautiful harmony of fire dancing, with the rhythmic beating of drums. Synergy Sessions will be held once a month this last quarter of the year: September 25, October 23, and November 13 (all Thursdays) at 7pm-11pm at B-SIDE (The Collective), Malugay St. in Makati City. 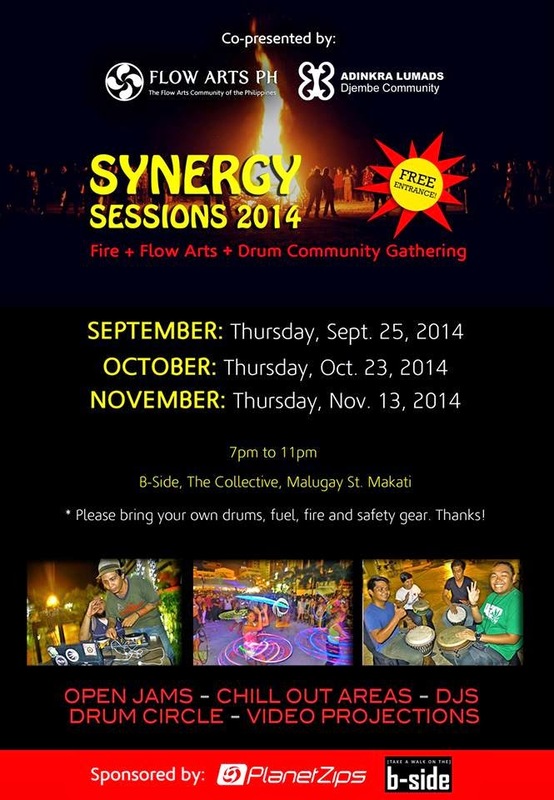 SYNERGY SESSIONS is a fire + flow art + drum community meet up co-presented by our Flow Arts Philippines Community and Adinkra Lumads Djembe Community, and sponsored by Planet Zips : Poi Philippines and B-Side, The Collective. As a highlight, they will be featuring resident DJ SAFEMANSOUND (Christopher Aranas Adalia) rockin' the decks and soundtracking their awesome flow sessions. Open sharing flow art and djembe workshops will also be offered for all the guests wanting to learn! As Aristotle once said “The whole is greater than the sum of its parts.” Everyone is welcome to join the fun and their growing local community. All jamming participants are encouraged to bring their own drums, fire props and fuel. The organizers will be strict with safety procedures, prop care and making sure everyone will have a fun time.